The RECI Contractor of the Year Awards were devised to promote and encourage standards of excellence in electrical contracting. Awards are made in two categories – Domestic and Commerical/Industrial. There are four finalists in each of the eight RECI designated regions throughout the country. The awards are a joint initative between RECI, Hibernian-Aviva and Arachas Corporate Brokers, all of whom are engaged in promoting best pratice in electrical contracting. The inaugral awards took place in the Burlington Hotel, Dublin on Friday 20th March 2009. 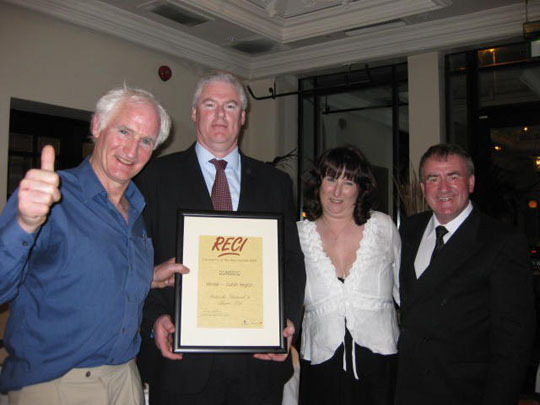 We are pleased to announce that we were presented with the RECI Contractor of the Year Awards 2009 Domestic Winner – Dublin Region. This photo features from left Duncan Stewart, Daniel Pedreschi, Niamh Pedreschi and John Desmond Chairman RECI. Sponsors of this award are RECI, Hibernian Aviva and Arachas Corporate Brokers.